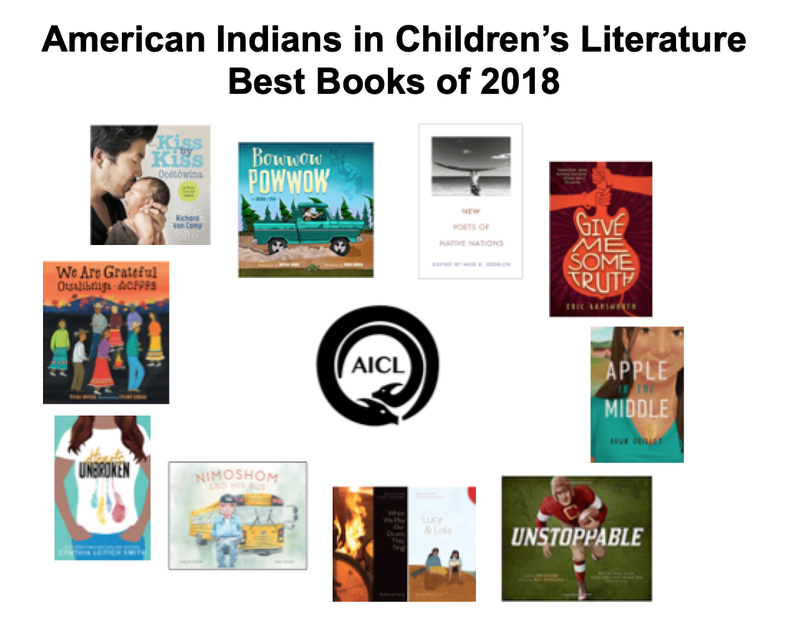 We are starting AICL's "Best Books of 2018" today (December 7) and will update it as we read other books published in 2018. Please share this page with teachers, librarians, parents--anyone, really--who is interested in books about Native peoples. As we come across additional books published in 2018 and as we finish reading and writing up reviews, we will add them to this list. If you know of ones we might want to consider, please let us know! For now, a partial list of to-be-read books by Native writers is at the bottom. Van Camp, Richard. (2018). Kiss by Kiss/Ocêtôwina: A Counting Book for Families. Orca Books, Canada. Campbell, Nicola I. and Julie Flett. (2018). A Day with Yayah. Crocodile. Canada. Child, Brenda and Jonathan Thunder. (2018). Bowwow Powwow. Minnesota Historical Society, United States. Coulson, Art. (2018). Unstoppable: How Jim Thorpe and the Carlisle Indian School Football Team Defeated Army. Capstone. United States. Hunt, Dallas and Amanda Strong. (2018). Awâsis and the World Famous Bannock. Highwater Press. Canada. Sorell, Traci and Frané Lessac (2018). We Are Grateful/Otsaliheliga. Charlesbridge. United States. Thomas, Penny M. and Karen Hibbard. (2018) Nimoshom and His Bus. Highwater Press. Canada. Boney, Roy. (2018). "Tell It In Your Own Way" in We Rise, We Resist, We Raise Our Voices, edited by Cheryl and Wade Hudson. Crown Books for Young Readers. United States. Tingle, Tim. (2018). When A Ghost Talks, Listen. Roadrunner Press. United States. (review in process). Tingle, Tim. (2018). Trust Your Name. 7th Generation. United States (review in process). Day, Christine. (2018). "Unexpected Pursuits: Embracing My Indigeneity & Creativity" in Our Stories, Our Voices. Simon and Schuster. United States. Erdrich, Heid E., ed. (2018). New Poets of Native Nations. Graywolf Press. United States. Gansworth, Eric. (2018). Give Me Some Truth. Scholastic. United States. Smith, Cynthia Leitich. (2018). Hearts Unbroken. Candlewick. United States. Morales, Yuyi. (2018). Dreamers. Holiday House. United States. BOOKS BY NATIVE WRITERS THAT ARE IN OUR TO-BE-READ STACK! These include books intended for the adult market, but that we might think can be read by older teens. BOOKS BY NON-NATIVE WRITERS THAT ARE IN OUR TO-BE-READ STACK! This list include books intended for the adult market, but that we might think can be read by older teens.